The GMHL will once again be showcasing the league's best talent over a 3 day period in November. This year the league's top 7 teams in the standings (after 15 games) will be participating in the event to showcase the league's top talent. The 8th team to participate in the showcase will be a GMHL Selects team comprised of players from the remaining teams that did not make the top 7 cut. Last year, the GMHL Selects team won the championship game in OT over the Elliot Lake Bobcats. The showcase will be played in a 'round robin' format with 4 teams in each division, followed by playoffs. All teams will play a minimum of 4 games in 3 days. 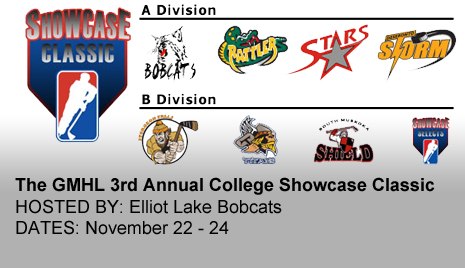 The teams that will be playing in this year's showcase will be the Temiscaming Titans, Bradford Rattlers, Sturgeon Falls Lumberjacks, Elliot Lake Bobcats, South Muskoka Shield, Vaughan Stars, Deseronto Storm and the GMHL selects. The final spot was still up for grabs in a tight race going into this weekend. The Toronto Moose, Mattawa Voyageurs and the Deseronto Storm have been fighting for that final spot and came up strong this weekend with 2 wins and claiming the final spot in the showcase. Currently there are 3 NCAA schools, 1 ACHA school, 2 Major Jr ‘A’ teams, CIS Universities and an NAHL team committed to be in attendance. There are also many hockey programs that will be participating through FastHockey.com and still more awaiting confirmation of staff availability. Last year we saw over 17 players receive offers from Colleges and Universities. This showcase will be a great weekend for hockey as the standings are closer than ever. We will see the league's top teams competing in one place and taking each other on for early GMHL bragging rights!